Aston Inn is located on the Michigan Road, which was the main north-south improved road to Indianapolis connecting the Ohio River and Lake Michigan. The inn was an important stopping place along the road. In 1852, when George W. Aston built this two-story, brick house, Michigan Road was a toll road that still served as a significant route. At this time, the house stood some ten miles from town. The Astons took in travelers on the road, including those arriving by stagecoach and drovers taking cattle to market downtown. The late 1850s saw the coming of the railroads north of Indianapolis, including one close to the Michigan Road, and a depot was constructed at New Augusta near the inn in 1860. Because of the coming of the railroad, the inn was only important for travelers for a short time. The inn is built in the Greek Revival style and is rectangular in plan with an early one story addition that served as a summer kitchen. The large, double-decked porch or gallery was used for circulation. On the second level of the front facade, French doors opened onto the roofed portico. The building has an entry hall with a grand staircase with a winding return at the top, a living room, and great room on the first level of the main section. 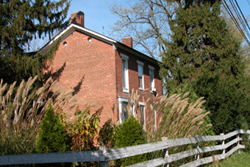 The simple yet substantial architecture of the house was once typical of prosperous middle-class urban and rural dwellings in central Indiana. Few examples remain today. Aston Inn is located at 6620 North Michigan Rd. The inn is a private residence, not open to the public.